From The Every-day book; or, Everlasting Calendar of Popular Amusements, Vol. II, by William Hone. Until this day partridges are protected by act of parliament from those who are "privileged to kill." In the shooting season of 1821, a fashionably dressed young man applied to sir Robert Baker for a license to kill— not game, but thieves. This curious application was made in the most serious and business-like manner imaginable. "Can I be permitted to speak a few words to you, sir?" said the applicant. "Certainly, sir," replied sir Robert. " Then I wish to ask you, sir, whether, if I am attacked by thieves in the streets or roads, I should be justified in using fire-arms against them, and putting them to death ?" Sir Robert Baker replied, that every man had a right to defend himself from robbers in the best manner he could; but at the same time he would not be justified in using fire-arms, except in cases of the utmost extremity. "Oh! I am very much obliged to you, sir; and I can be furnished at this office with a license to carry arms for that purpose?" The answer, of course, was given in the negative, though not without a good deal of surprise at such a question, and the inquirer bowed and withdrew. * Feast of St. Giles, patron saint of beggars and blacksmiths, among many others. The name is familiar to Regency readers as a famously crime-ridden section of London. 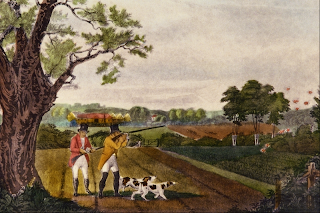 Illustration by Robert Havell, Partridge Shooting at Windsor. Today is really my birthday (half a century to be exact). My husband remembers it because it is the first day of lobster season in Florida. Was that applicant named Bernie Goetz by any chance? I just stumbled across your site and I love it!! So happy to have found it. Though I studied (art) history in college, I was always more interested in the lives of the people than the actual evens. So fascinating... Love the way you've put this all together! I believe that in England the first of September was also the traditional day for sowing next season's rye. The Return of the Fashionable Fan?